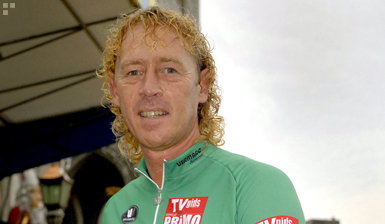 1980’s superstar Eric Vanderaerden has spoken of his feelings following the PedalTech disaster. Perhaps his greatest concern is that his son Michael is left scrambling for a place on a team and it is anticipated that he will sign, at reduced terms, for minor team Profel. Eric said that nevertheless, he is not tired of cycling and that he has got to know someone he can fully trust and that together they will try to work out a good idea for next season. Mr Lefevre said that the detectives did not search the house, but simply asked a few questions related to their investigation into the use of illegal drug by the cyclocross rider Tom Vannoppen who is reported to have mentioned Tom Boonen during questioning.Patrick Lefevere told the VRT’s sport service Sporza that “there have been rumours circulating for a while now since Vannoppen started suffering from depression”. “He used to train with Tom, but then so did many others.” Lefevere told Gazet van Antwerpen that the detectives asked about how Tom Boonen spent his free time and whether or not he still lived with his parents. (the police must be the only people in the whole of Belgium not familiar with all the details of Tomeke’s private life, but that’s the Boys in Blue the world over). The team manager added that the detectives had received a satisfactory answer to all their questions. He said that the investigation was a private matter and had nothing to do with the Quick-Step team. The judicial authorities have since said that Tom Boonen is in no way involved in any illegal activity but just to be sure a pan of Mrs Boonen’s special home made stew was taken away for analysis. American Kayle Leogrande who rides for Rock Racing is said to have filed a lawsuit against the U.S. Anti-Doping Agency alleging that it planned to test his B urine sample after his A sample tested negative. Associated Press reported on Thursday that an anonymous professional cyclist had filed a lawsuit against USADA on behalf of “John Doe” seeking an injunction to prevent the anti-doping agency from ever testing the B sample. The lawsuit, filed on January 23 in Los Angeles County Superior Court, claims that USADA originally planned to test the B sample on January 15, but back-tracked after “John Doe’s” attorneys demanded the agency abandon the second test. USADA’S Bill Bock said on Friday that that the testing of a B sample after a negative A sample “is not prohibited, and certainly we believe it to be permissible.” Bock described the lawsuit as “utterly frivolous and morally bankrupt.” The urine test in question occurred at Superweek, where Leogrande won three events, finished second at three events and placed second overall. It is claimed that USADA is collecting testimony from witnesses who have alleged that Leogrande has admitted doping. Such testimony is admissable under provisions of the WADA code that allow the use of non-analytical evidence in building a case for an alleged doping violation. 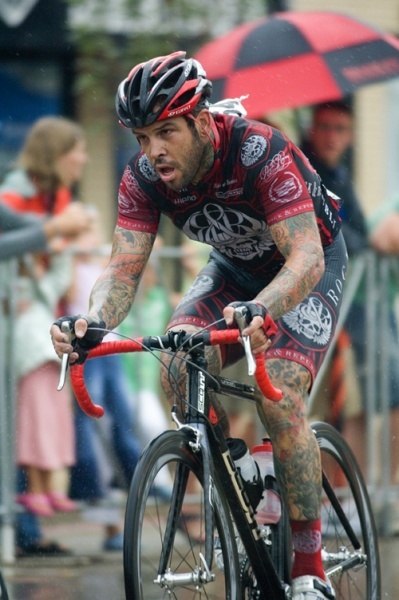 Rock Racing has made headlines for signing former ProTour riders whose careers were marked by doping scandals, including Tyler Hamilton, Santiago Botero and Oscar Sevilla and has had discussions with Floyd Landis. It is Landis’s attorney who is acting for “John Doe”. As I understand it “John Doe’s” case is that as positive A and B tests are required to constitute a positive test and testing the B sample following a negative A sample can only be construed as harassment. Well yes and no. If the A test was just on the negative side of the line wouldn’t it be reasonable to take a second bite at the cherry and if it came back positive then warn the rider. It is no surprise that Museeuw has pulled out of the PedalTech deal. He already supplies the best junior team in Belgium and his next move must involve the certainty of rides in Belgian semi-classics eg Het Volk and GP E3 with the hope of a start in the Ronde. Although Johan told me that the UK is a “good market” I can’t believe that seeing his bikes in the Lincoln Grand Prix would get him exited. Should you have that cake? The following interesting article was cribbed from VeloNews. I have not the slightest idea if the science is sound although the writer does provide an explanation for those who can follow these things. I have learnt that if I go for my usual potter and stop for a coffee and an eccles cake I will have put on weight! And yet I still refer to “going training” how sad is that. We think it’s pretty cool and Dr. McDonald offers up an interesting discussion to explain his approach. Five young riders showing off the latest in Edwardian sportswear. 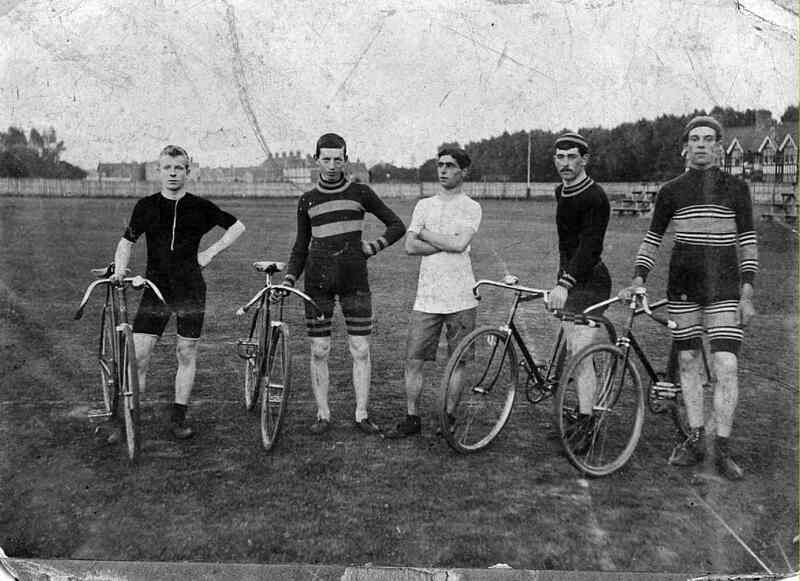 The young man in the centre, in the tasteful attire, is Albert Wren of Worthing Excelsior C & AC. 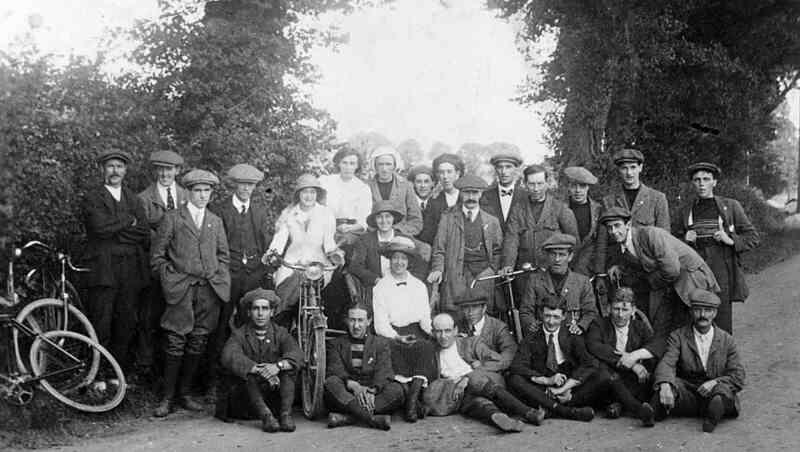 For this photo the men have been joined by the ladies and a motor bike. Can you imagine posing for a photo on the A24 these days?